It’s easy for me to explain my ties to Vermont in my business – I photograph half of the year’s weddings in Vermont. We went to college in Vermont, we stayed a couple years longer, half our family and half our friends are there… I take every chance I can to book more time up there through my wedding photography – and also just for fun! But I recently found myself awkwardly raising my hand on a “who’s a Vermont runner?” question! Me me me! Sure, I live on Cape Cod. I have a blog called Cape Cod Runner, for chrissake! But ME! Vermont is truly half of me. This past summer was my busiest Vermont wedding season yet, and I loved it! I’m so grateful our friend Sarah was up for a few runs with me! 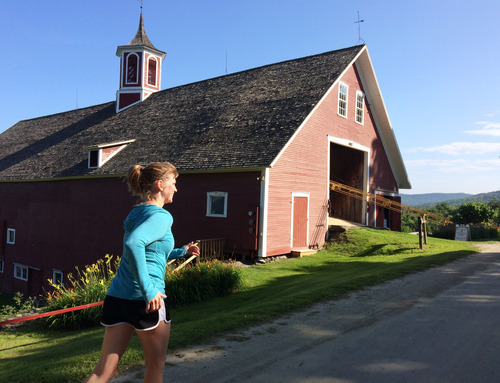 We ran on all dirt roads in Waitsfield, overlooking Sugarbush Resort, the Round Barn, some very lovable cows, and the beauty of the Mad River Valley! 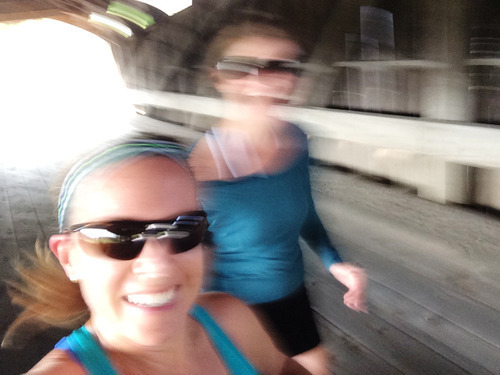 We even crossed the covered bridge in downtown Waitsfield a few times – way more fun in your running sneaks! Sarah may have also introduced a new interval workout, as we took turns pushing the stroller on my last trip up there! Whoa!! The Sweet Spot also happened to provide the best post-run recovery treat I’ve ever had – a homemade grapefruit popsicle!!! YUM!!! My upcoming Vermont races include the Stratton Mountain Gobble Gobble Wobble on Thanksgiving, and the Vermont City Marathon in May. Here are a few others on my must-do list! 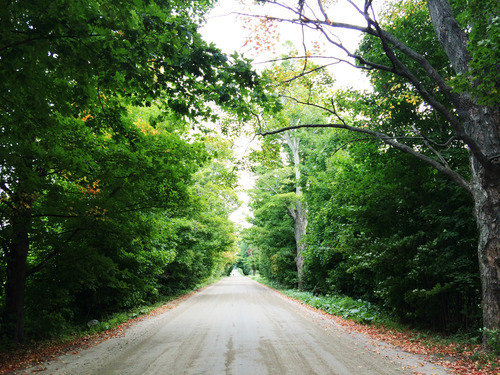 Have you run any of these awesome Vermont races? Any others you suggest? Do you have another place you call home in your heart? Do share! ← Race Week on Cape Cod!